Note that the HB-33 lens hood for the earlier (non-VR) version of the 18-55mm kit lens attaches in the same way, by spring-loaded clips that fit into a groove around the front of the lens, and will work perfectly well on the VR lens but can't be reversed on it because of the VR lens's larger diameter. That's the only reason you need the HB-45 hood instead on this lens. Also, to the fellow who complained that this hood is not flower-shaped: that's because the front component of the 18-55mm lens rotates when focusing. Flower-shaped hoods are only suitable for lenses with non-rotating front ends, since the "petals" must be aligned properly with the lens. This plastic, circular hood should have come standard with the D40 or D60 18-55mm Nikon AF-S DX kit lens, but unfortunately it does not. The hood's outside moulding is of the same non-glossy textured finish matching the D60's body perfectly. It fits bayonet style over the lenses focus ring, thereby also allowing a filter and a lens cap. 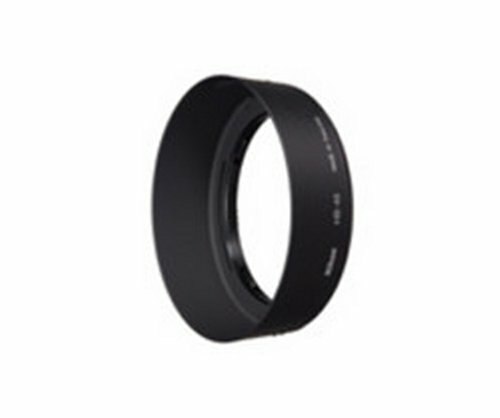 The hood's inner ring also has notches that grip the len's focus ring, allowing for manual focus by gripping the hood without the hood sliding. If not for its high price for a plastic hood, I would give it 5 stars. Does the job...looks pretty nice imo. It gets in the way of the built in flash on a D60 and will leave a shadow on your images. But, if you use an external flash (SB600/800), there are no issues. **Note: The previous reviewer said it can't be secured in reverse orientation. Not true. This can be secured on the 18-55mm VR in reverse orientation when not in use. Doing so obviously covers the focus ring, though you can still zoom okay.